The floods that surged through the Mississippi River basin are subsiding, but their impact is far from over. As the floodwaters swept over farms and towns in May and June 2011, they scoured fertilized soil from the ground and carried it downstream. 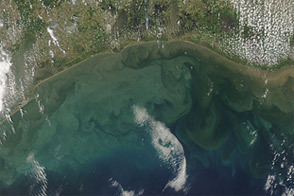 Swollen rivers dumped thousands of tons of nutrients into the Gulf of Mexico, where they are forecast to cause a record "dead zone" this summer. 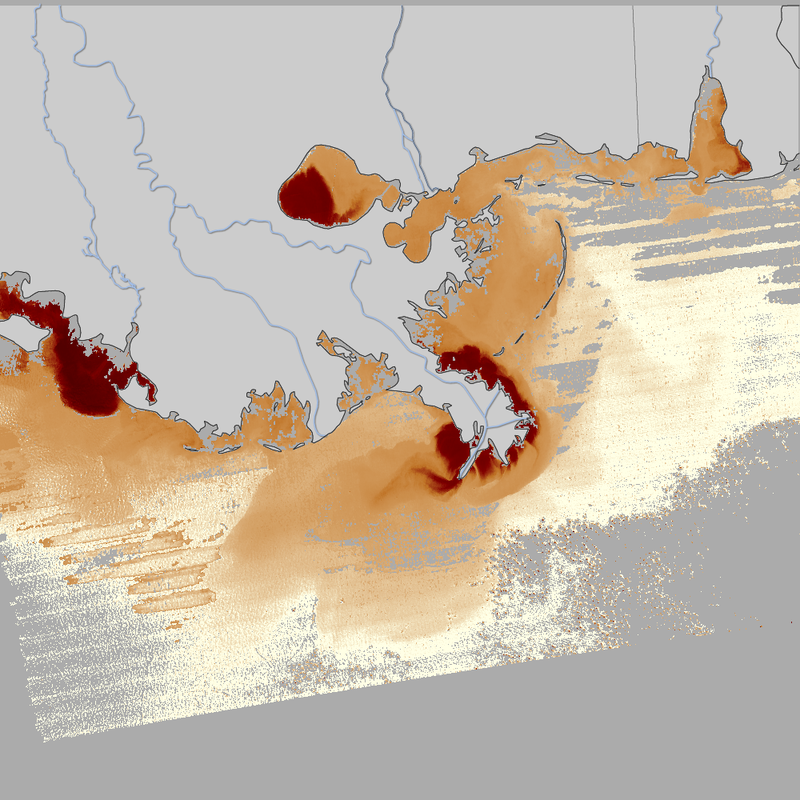 These images quantify the amount of nutrient-laden sediment flowing into the Gulf of Mexico and Louisiana's Lake Pontchartrain throughout May and into June 2011. The highest sediment concentrations, around 400 milligrams per liter, are dark brown. Places where the sensor did not measure sediment (largely because of clouds) are dark gray, and land is pale gray. Scientists at the National Oceanic and Atmospheric Administration (NOAA) made the maps by interpreting measurements from the Moderate Resolution Imaging Spectroradiometer (MODIS) on the Aqua satellite. 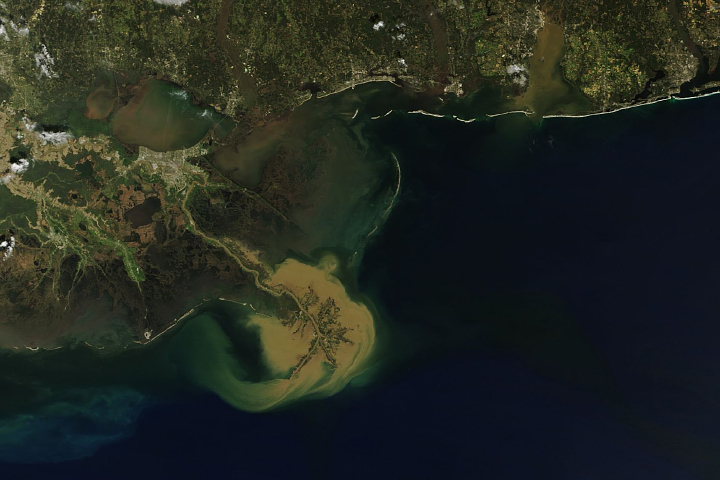 Photo-like MODIS images show the mud spreading into the Gulf. The first image above, from April 29, 2011, shows the Gulf of Mexico and Lake Pontchartrain before the floods reached them. Even though the river plumes had not yet discharged the floods, they still carried plenty of sediment from normal spring rains and runoff. On May 9, the U.S. Army Corp of Engineers began opening the Bonnet Carre Spillway to relieve pressure on levees along the fast-rising Mississippi River. By May 15, most of the bays in the spillway were open and diverting water into Lake Pontchartrain. 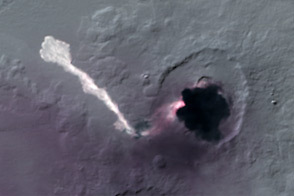 The resulting plume of sediment is visible in the center image from May 17. 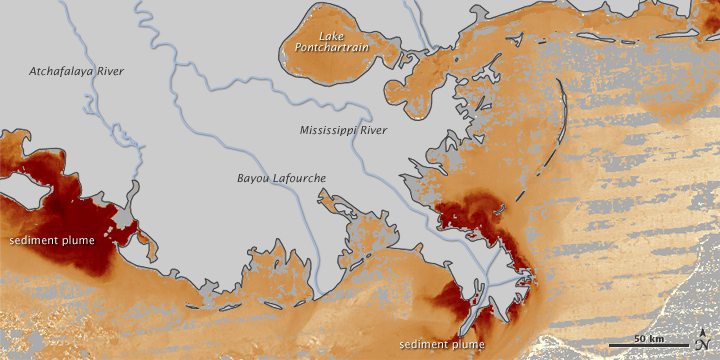 The image also shows the first burst of sediment entering the Gulf of Mexico from the Atchafalaya River. The Old River Flood Control Structure in central Louisiana is used each year by the U.S. Army Corps of Engineers to redirect some of the flow from the Mississippi River to the Atchafalaya. This year on May 14, the Corps also began to divert water from the Mississippi through the Morganza Floodway. Whether from Old River or Morganza, the sediment-bearing flood waters reached the Gulf of Mexico on May 17. Though the plume is smaller than on April 29, it contains a much higher concentration of sediment. The final image depicts June 1. By this time, the flow from the flood had slowed. 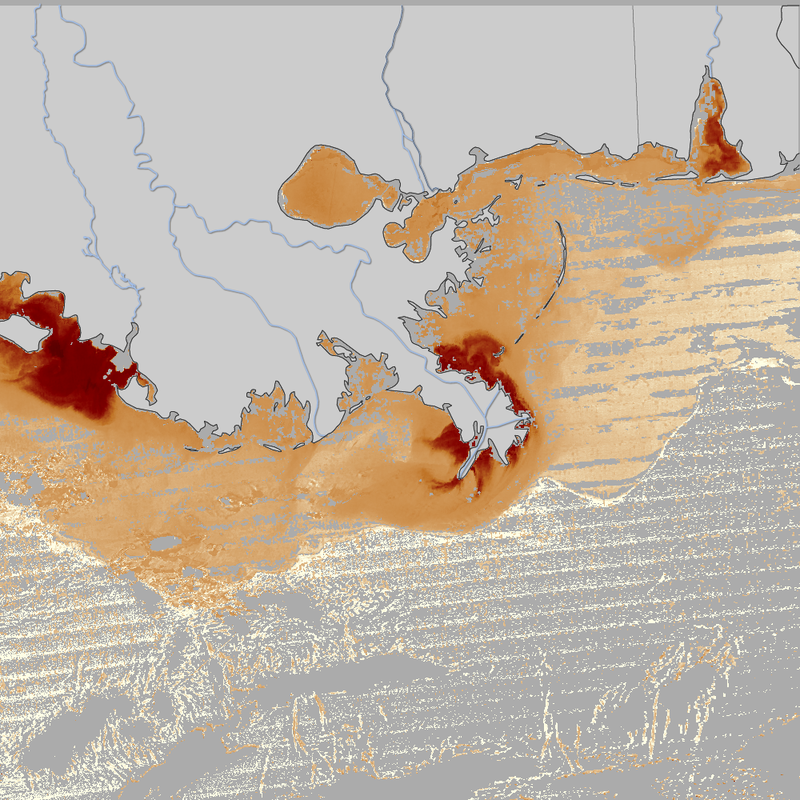 The sediment plume in Lake Pontchartrain is smaller and less concentrated. In the Gulf of Mexico, however, the sediment has spread over a much wider area. All of this sediment carries nutrients like iron and nitrogen from Midwestern and Southern U.S. farms into the Gulf of Mexico. In May, an estimated 164,000 metric tons of nitrogen—35 percent more than average—entered the Gulf, reported NOAA. These nutrients feed phytoplankton, which are anticipated to flourish in coming weeks. When the plankton die, bacteria break them down, consuming oxygen in the process. Eventually, the decaying phytoplankton and gorging bacteria will sap much of the oxygen from the water, creating a dead zone where other marine life cannot survive. 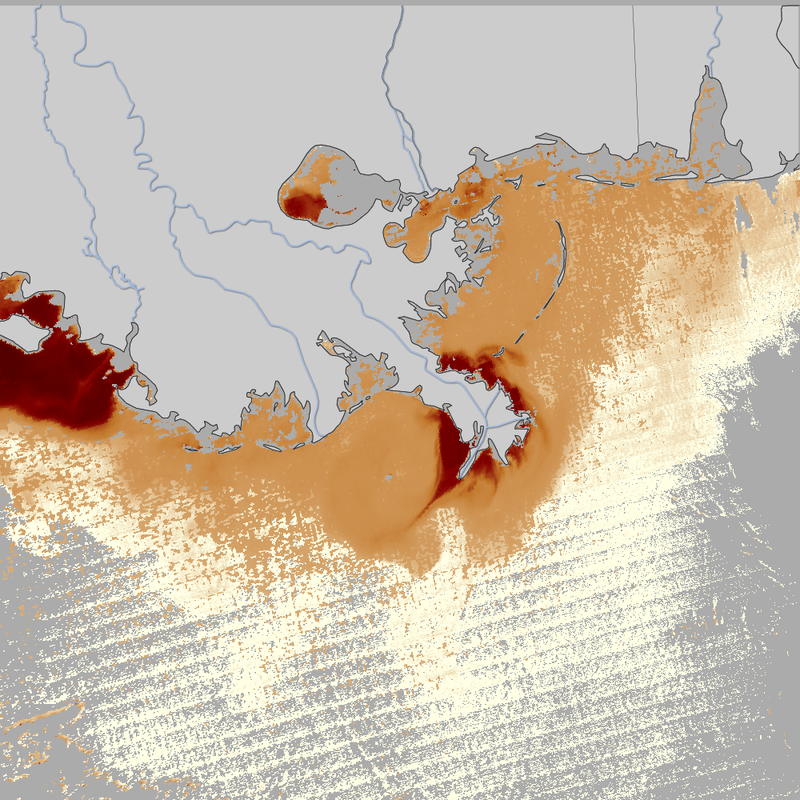 NOAA expects the Gulf of Mexico dead zone to reach between 8,500 and 9,421 square miles in 2011, which would make it the largest dead zone to develop since measurements began in 1985. NASA Earth Observatory images created by Jesse Allen, used MODIS sediment data provided courtesy of Michael Ondrusek (NOAA) and the MODIS Oceans team. Caption by Holli Riebeek using information from Michael Ondrusek and Richard Gould. 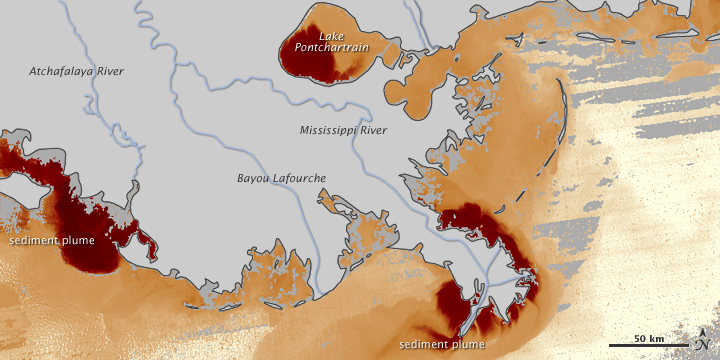 These maps illustrate how much sediment flowed into the Gulf of Mexico during the floods on the Mississippi River in May and June 2011. The nutrient-rich sediment is expected to contribute to the development of a record dead zone this summer. Annual spring floods affected the Midwestern United States and parts of Canada beginning in late February 2011. Flooding continued into May, reaching historic levels along the Mississippi River. National Oceanic and Atmospheric Administration. (2011, June 14). 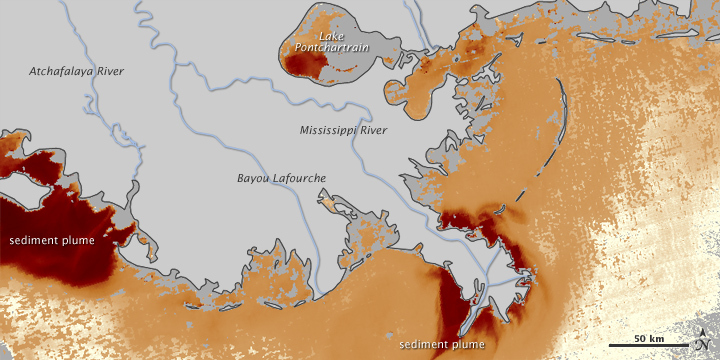 Major flooding on the Mississippi River predicted to cause largest Gulf of Mexico dead zone ever recorded. Accessed June 23, 2011. Ondrusek, M.E., E. Stengel, C. Kinkade, R.L. Vogel, P. Keegstra, and C. Hunter. (2011). Optical Characterization of Total Suspended Matter in the Chesapeake Bay. 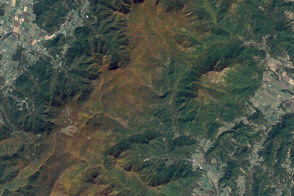 Submitted to Remote Sensing of the Environment, In revision.